This brief article includes a tutorial that shows how to enable SSL for on-premise Mule runtimes. In my previous article, I demonstrated how to change the Mule application logging level dynamically by using JMX MBeans. In that article, I skipped the procedure on how to enable SSL for JMX of Mule runtimes. Apparently, in the production environment, we will need to enable both authentication and SSL for the security purpose. I will demonstrate the details about enabling SSL for on-premises Mule Runtimes. I will use local generated Cert for demonstration purpose. You may need to authorize the cert for your organization, but the basic procedures are the same. The above commands will create keystore and truststore, which will be used by Mule Runtimes. To instruct a Mule Runtime to use the keystore and truststore, we need to update wrapper.conf file. Note that I use jmxremote.access and jmxremote.password for the user permission and authentication. The details can be referred to in my last article. 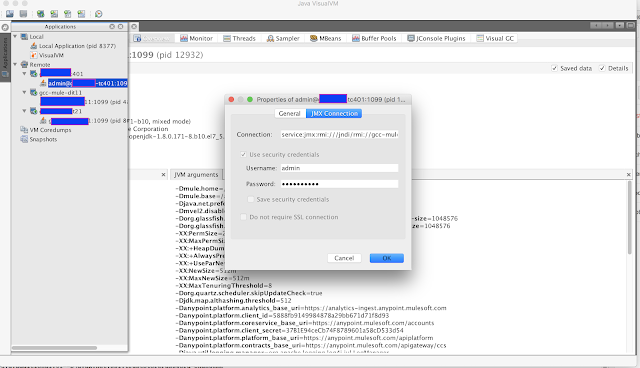 The following snapshots show how the page of login with SSL is enabled.